Easter is just around the corner and one of the stables for this holiday are dyed eggs. I hope you like my version of the famous Despicable Me characters of the Minions as Easter eggs. Start out by boiling the eggs and cooling in the refrigerator until they are cool. For yellow layer, Place 1/4 cup of vinegar, 20 drops of yellow dye, and enough water to cover egg; Soak the egg for 10 minutes. Place the egg on a cooling rack for 30 minutes. For blue layer, place 2 tablespoons, 20 drops of blue dye, and enough water to cover half of the egg; Hold egg straight up for 5 mins. 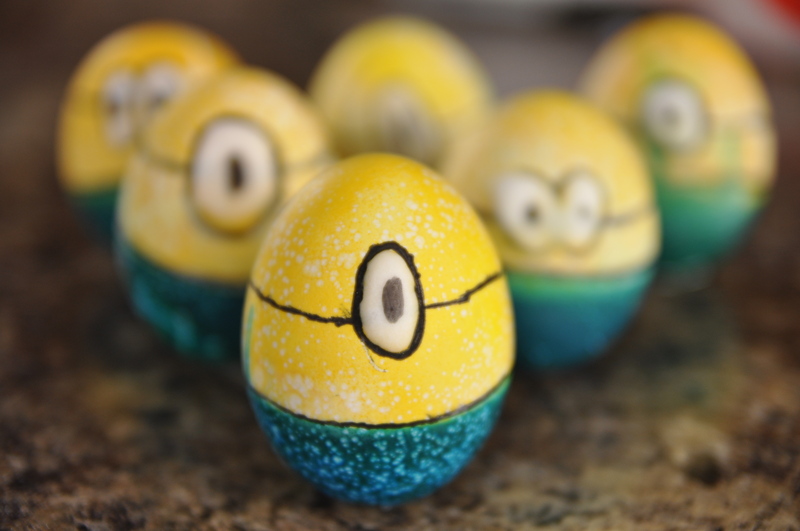 With black sharpie add personality to your Minion egg and place a dot of royal icing for the eye. If you want your minions to stand, lightly tap the bottom until they dent. Refer to video above for any questions. Oh man…I wish I’d seen these before Easter! These are AWESOME – and my dad thinks the minions are hilarious, so I’ll have to keep this idea in mind for next year and make some for him. So creative! The three little boys next door, LOVE, Minions. They will go insane when these appwar in their baskets and hidden in the yard. Thank You.